In a bowl, combine the flour with baking powder, soda, salt, and sugar. In another bowl, whisk together the butter, ricotta cheese, egg, orange juice, milk, and vanilla. Sift together the flour, baking powder, salt and sugar. Combine the egg, milk, butter and ricotta in a separate bowl and mix well. Make a well in the center of the dry ingredients and pour in the wet. Gently mix in the wet ingredients until you have a smooth batter. Fry spoonfuls of the mixture in a warm, non-stick frying pan. Add a generous tablespoonful’s worth of blueberries to each flap jack (on the un-cooked side) before flipping over. Remove the flap jacks from the pan and keep warm in a low oven until ready to serve. 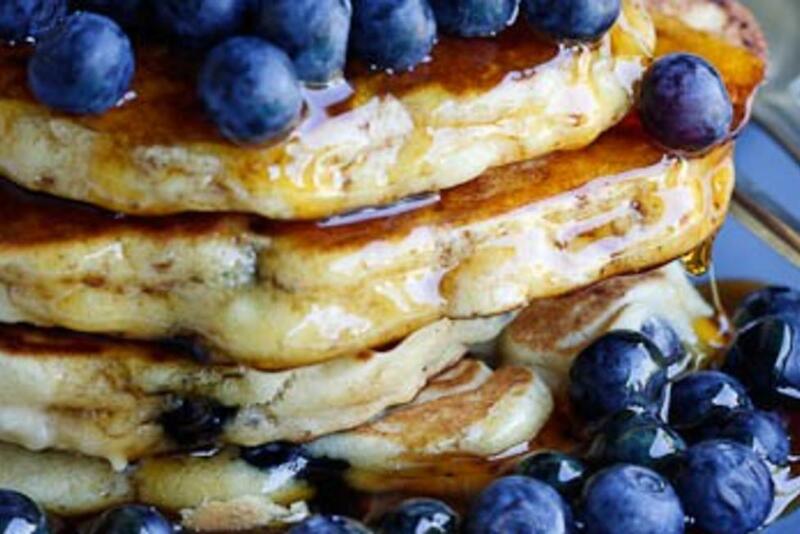 Serve with syrup and fresh blueberries.